Igor Novikov and Alex Stripunsky were absent for the first time in a long time, as perhaps they have already left for the international tournament in Kansas. We had some rarer faces to replace them this week as we were delighted to see GM Joel Benjamin and IM Dmitry Schneider (back from his first semester of college at UT-Dallas) joined the show. With 18 players, we garnered a pretty nice prize fund as due to the new $300 sponsorship, we were able to make a first place prize of $450. Imagine what the prizes will be in the summer if we start getting 30+ players again! Next week there is talk of a subway strike, however even if it should happen, the tournament will go on. We wouldn’t want to let down GM Roland Schmaltz (Hawkeye on ICC), who will be traveling ALLLL the way from Germany just to play in the NY Masters! In all we had a very balanced field tonight, as 13 of the 18 players were rated above 2300. Sena was the only one to hold their higher rated counterpart to a draw, as despite having an extra pawn in a queen endgame, he had no way to stop Burnett’s queen from dealing perpetual check. White seems to have quite a pleasant game here. All of Joel’s pieces are very well placed whereas black’s knight looks clumsy on c7, and the d5 pawn is a big target. Faced with a difficult position against a GM, a blunder occurs, as often happens in such cases. Can you spot white’s win?!?! I had quite a nice position against Yudasin, but I neglected my kingside and he outplayed me with a nice attack. The sensation of Round 2 was Jay Bonin’s win over Joel Benjamin. It seemed like a pretty normal position but Joel allowed a winning shot. Jay thinks that it may be the first time he’s ever started the event 2-0. >From what I saw, it seemed as if Dmitry Schneider was quite fortunate to win against Sarkar as well. The live internet game starred two of the hottest players around, as both players have seen their ratings rise about 150 points since the advent of the NY Masters. Whose hot streak would come to an end tonight? So far following the game Kasparov – Yusupov Zagreb 1989 and Karpov – Kramnik Linares 1998. 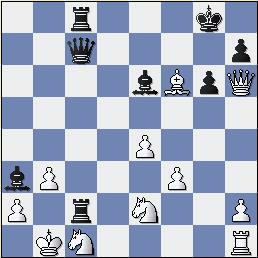 You are trained not to consider taking such pawns, but in this case there is no way to trap the knight on a7, or take any serious advantage of white’s loss of time. 20. 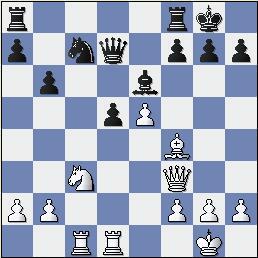 ... Bb8 21.Nb5 Nf5 22.a4 Nd6 23.Nxd6 Rxd6 24.Rfb1 b6 25.Rb5 Bc7 26.Rab1 Rdd8 27.Qb7 Rb8 28.Qc6 Rfc8 29.Qf3 Ra8 30.Kh1 Rd8 31.Qb7 Rdb8 32.Qc6 Rc8 33.Qf3 Rd8 34.Ra1 Qd6 35.d4 Qd5 36.Qxd5 Rxd5 37.a5 bxa5 38.Bxa5 Bd6 39.Bc3 Rxa1+ 40.Bxa1 f5 41.Kg1 Kf7 42.Rb7+ Be7 43.Kf2 cxd4 44.Bxd4 g6 45.Kf3 Ke6 46.g4 fxg4+ 47.hxg4 h5 48.g5 Ra5 49.Rb6+ Kf7 50.Rb7 Ke6 51.Rb6+ Kf7 52.Be5 Ra7 53.f5! With this move white is crashing through. If 53. ... gf5 54.g6 Kg8 55.Rb8+ game over. This was the big money round as a win here meant there would good chances of having a last round draw and splitting the prize fund. A split of 1st/2nd would be $305, not a bad payday for one night of chess! You could tell this would be an game the crowd would love, as we should see mutual attacks as white will attack the kingside as black attacks on the queenside. Yudasin has been playing this variation all his life, but Schneider has just begun playing it with early success, as he used it to defeat GM Evgeny Najer in a previous NY Masters. 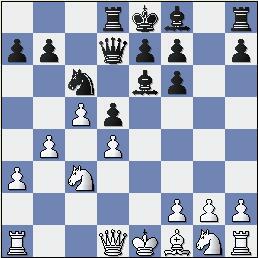 14.Bb5 Nb6 15.Qf2 Nc4 16.Bxc4 Bxc4 17.Bb6 Qc8 18.Nxa5!? Dima is a brave man to take such a pawn, opening the a-file for blacks rook to use. 18. ... Be6 19.Nb3 Qc6 20.Kb1 Ra6 21.Be3 Rfa8 22.Nc1? This move was a mistake. According to Yudasin, better was 22.g5 Nd7 23. Nd5, when quite an unbalanced position would have been reached. This is the point! 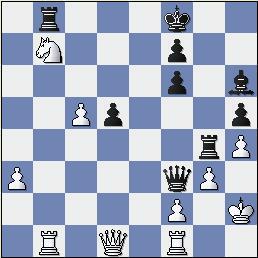 Whenever black is able to achieve this move comfortably in this opening, it’s usually a sign that white has gone wrong. 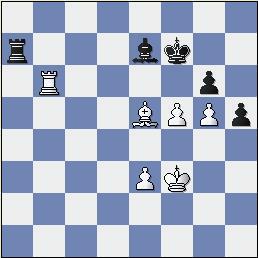 Notice that black’s attack seems to be light years ahead of white’s after this move. Also notice that black has made VERY fine use of the a-file that white supplied to him. White has no real choice. 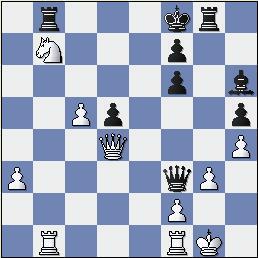 If 25.Nd5 Bxd5 26.exd5 Qxd5 and black has the double threat of dxe3 and Rxa2. A fantastic shot by Yudasin, although not followed up most accurately. The idea is to open the a file for the black rook. It takes about 30 seconds to see why this move has any point at all. This move wins but better was 39. ... Rxe2! 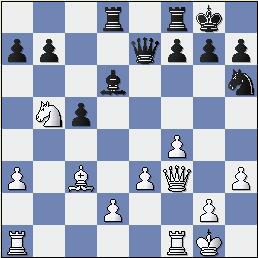 40.Nxe2 Qc2+ 41.Ka1 Bb2! 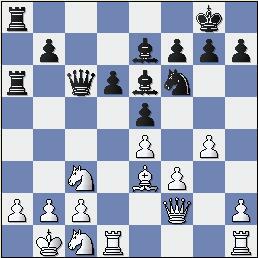 42.Bxb2 Ra8 with mate to follow. Yudasin considered playing against Lapshun, as a win would be worth $450 and a draw only $305, but he decided that $305 was enough for one night. Lapshun must be very happy with his recent results. As of week 35 he had never won first place in the NY Masters. As of two weeks later, he has won first place two times! Bonin got 3/4 and was waiting for the result of our game to see who would join him at 3rd place. Following some analysis that John Donaldson showed me when I was about 16 years old, yet this was the extent of my knowledge. White plans to use his queenside majority, whereas black plans to use his two bishops and the open lines created on the kingside. 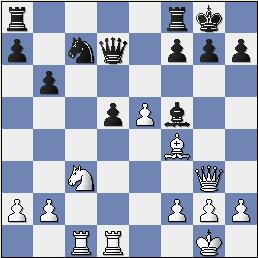 I only found one game from this position, and black (GM Zapata) captured on f6 with the e pawn. Somehow at this moment I thought my position was completely hideous, but it was one of my common traits of underestimating my position. It’s taught me that even when I think my position is bad I have to keep working hard to find good moves, since I often have no idea whether its really good or not. 20.Rb1 was a move to be considered although I didn’t see it during the game. This is a strong move, because Rb3 is coming to chase away the black queen. 25. ... Rh4!! 26.gh4 Bf4! 27. Kg1 Qh3!!! (Sorry I just like hitting the exclamation mark key)and its forced checkmate. After this discovery I lessened my ambitions to achieving a draw. I was frightened by 24. ... Bf4 but then I found the convincing defense…..
25.Rb3! 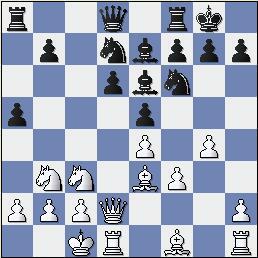 Qxb3 26.Qxf4 threatening the rook on b8, and threatening Qh6-h8 with perpetual check. Black has no way to avoid both threats and thus the game would be a draw. The net result of this game was that we put an extra $45 dollars in Jay Bonin’s pocket, as now he would win clear third place. Hope to see you all next week, as with Roland Schmaltz in town (with a career NY Masters winning percentage of 88%), you know it will be an exciting week!